Cardinals tight end Ricky Seals-Jones has a disciplined approach to football and finances. Fans might hear about superstar contracts and assume that anyone who plays in the NFL is set for life, but for most young players entering the league, football and financial success are not a given. Ricky Seals-Jones is learning what it takes in real time. When he was a junior at Texas A&M, Seals-Jones found himself facing a common question for college athletes: Should he play out his final season as an Aggie or take a chance on the pros? After a lot of prayer and discussion with friends and family, including his cousin, Hall of Fame running back Eric Dickerson, Seals-Jones elected to forgo his final year of eligible play and headed to the NFL draft. But draft night 2017 came and went without his name being called, prompting a period of personal, athletic and monetary uncertainty. 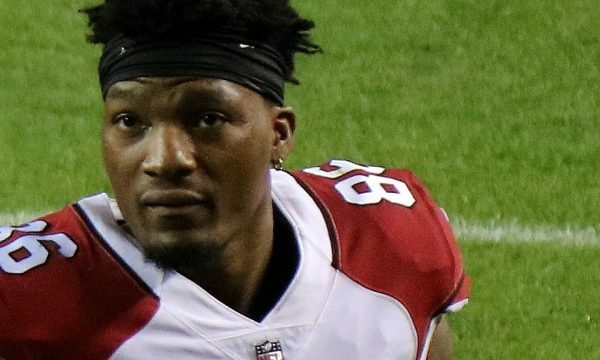 Signed to the Arizona Cardinals as a free agent, Seals-Jones relied on the help of a business manager, Gustavo "Goose" Miguel, to help him keep his finances in check as he worked his way up from the practice squad to the full-time roster. By staying on budget and growing his credit score from 580 to 730 since January, the rookie was well on his way to mastering his financial footing. Seals-Jones’ footwork on the field paid off as well. >> MORE: How can I build credit? In his first-ever career game, on Nov. 19, he scored two touchdowns and pulled in 54 yards from three catches against the Houston Texans. The Cardinals may have lost the game, but Seals-Jones won the attention, and respect, of the fans. We caught up to Seals-Jones to talk about the game, the money, and how he plans on getting himself his dream home. To get started, I’d love to know more about your childhood and how you became interested in football. When you’re from Texas, you kinda just get thrown in it. That’s how my parents kept us out of trouble — they put us in a lot of sports. I fell in love with it. I started in second or third grade playing flag, and in fourth grade went to tackle. And it was just football from then on. And what was your financial experience like growing up? Did you have an opportunity to learn about personal finance? A little bit, but not as much as I wanted to. I started learning about it this year when I met Gustavo. He broke it down. Some of it I didn’t know about, but I became really interested as I learned more. I’ve always heard the more money you get, the more problems you have. I don’t have a lot, but as I started to get more, I felt like I had more bills and more things to pay for. For me, just managing the money was big. I used to be like, “OK, I’m going to pay bills, whatever I have left I have left. If I run out, I can ask Moms for money.” [Laughs] Now, I know how much I have in bills, I pay them off, then figure out how to manage what’s left to hold me off until next month. It’s just a lot easier once you’ve figured that out and stay with your budget plan. Is that hard for you? Staying on budget? Not really, because I’m not a flashy guy. If I want to go buy some clothes, they aren’t high-end designer. I’m more of a laid-back type of guy who just isn’t into all that flashy stuff. That’s not easy for everyone. A lot of people try to keep up with the Joneses and live beyond their means. My biggest advice would be to make a budget that gives you a little leeway. If you want this expensive bag or shoes, you still have some leeway, but stay within your budget, stay in your lane. When I started making a lot of money, I’d see guys with these expensive shoes and be tempted. But you never know what might happen. So that’s what I’d tell people, stay on budget, at least until you’re three or four years in and making a lot of money. But until then, be average. You’re playing in the National Football League. There’s no need to be flashy. If you can make a name for yourself on the field, then you’ll be good from there. That uncertainty around your athletic future must be challenging. While on the practice squad for the Cardinals, you were being paid weekly, correct? How did you manage that? The first three weeks I was on the practice squad, I made roughly, not even $2,000 a week. That was tough. I just saved up as much as I could. After those three weeks, they bumped me up to the roster, and those checks are a little different. So after I started getting more money, I talked to Goose and made a budget. I put all my bills together, added them up to see where I was at. And I’m still on that budget now — it’s been great. I hear you’ve also had a lot of success boosting your credit score. Honestly, in this world today, your credit is everything. I told Goose that I wanted to get a car, obviously, but also get a house later on, maybe next year. The first thing he asked me was, “How’s your credit score?” Coming out of college, I had no idea. It’s unbelievable how much I got the score to go up in just a couple months by learning little tricks, like using my credit cards more often, to help spike it. It’s one of those things you’ve got to stay on top of. Also, do your research. Go to a bank, talk to a financial advisor, read up on how the credit process works — it will get easier. We had the opportunity to speak to your cousin, Eric Dickerson, about his financial journey. Has he been giving you money advice? His advice is, “Don’t go broke. Don't spend your money.” It’s good advice. Short and sweet. He doesn’t want me to make his mistakes. When I’ve asked him for any kind of advice, he’s never steered me wrong. Whenever he speaks about something, I really listen and tune in. Especially finance. He’s been up and down with his. He made mistakes and learned from them. I bet that extends to your football career, too. I think your story is really interesting, how you switched positions from being a wide receiver in college to playing tight end for the Cardinals. What was that process like? Oh man, it was tough. I started training for it right after the college season. I decided I wanted to come to the NFL and take my chances there, and it was rough at first. I didn’t know anything about tight end, and was learning it on the fly. I just kept my head down, kept grinding, kept doing what the coach asked. And I kept studying. It’s like a different language when you first get here. I’d never been in a huddle before, listening to plays from the QB. I was used to getting a hand signal for a play. I just adapted and kept fighting. I made the practice squad, and one of the tight ends went down with an ankle injury, and they brought me up. I got my shot, took it and ran with it. I think that can relate to finance, a little. Having to adjust course to be successful. It’s all about how you approach it. You can’t approach your finances with some halfway in, halfway out the door strategy. You have to really focus in on what you’re doing. You might mess up and it might cause you to lose money, or just end up in a bad financial situation. The same is true with football. If you don’t go out and know exactly what you’re doing, you could get someone else seriously hurt, but you might also get yourself a career-ending injury. When getting finance advice, I try to pay attention and focus the same way I do when I’m looking at plays. Now you’ve certainly had an exciting couple of weeks. How did it feel to go from the practice squad to full-time roster to getting some pretty great game time? It’s amazing. What I went through — from being bottom of the barrel to a guy who is just glad to make the p-squad. I knew that wasn’t me, being on p-squad, and I was grateful they saw potential in me. It was great getting the first actual start back at home and balling out against the Texans. I was just looking to make one or two catches, but to go out and score twice was huge. It was great to get out there and put all my hard work on display. This season’s wrapping up. Next year it looks like your contract is increasing by just shy of $100,000. I am not focused on that next contract right now; I’m focused on the game right now. Right now it’s just football for me. I’m studying a lot of film and resting. That’s key for me in the back end of the season. In college, we would have been done two weeks ago. I have to make sure my body is still in top-notch shape. I’ve been saving up. By the time I get to next season, I don’t want to be stressing about money. I just want to be living comfortably and not depending on the next paycheck. You also mentioned wanting to buy a house. Yeah, that’s my one thing — a house. I’ve always wanted to live on a lake somewhere in Texas. I love to fish, and that’s how I want to spend my offseason days. Any plans to pay back mom for those times in college you asked for money? She’s definitely going to get taken care of. Do you have any parting advice for other athletes? Save your money. That’s the No. 1. If you can live by that rule, if you can live by that one rule right there, everything else is good. I’ve seen a lot of guys get in trouble because they’ve never seen this much money coming in so fast and they don’t have people in their circle that can help them manage it. On top of that, family members or friends might start asking for this and that, and it’s not easy to tell them no. If someone asks me for something and I don’t feel comfortable, I can say, “Let me talk to my financial advisor and see what he says.” If you don’t have that person in your circle, it can be tough. It’s hard to tell your family members no, but sometimes you just have to look out for yourself.